Replacement / additional roll for "WZ 27" pasture reel. Suitable for approx. 500 m polywire and 200 m tape (10 mm). 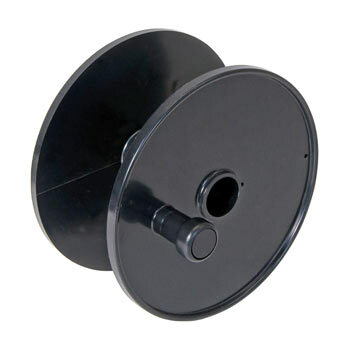 Replacement / additional roll for "WZ 29" pasture reel. Suitable for approx. 1,000 m polywire and 350 m tape (10 mm). 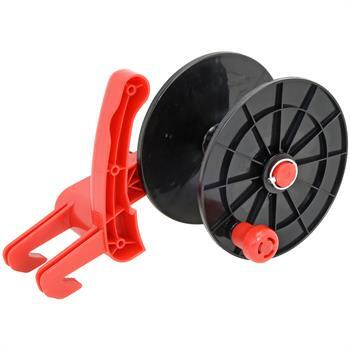 Manual reel, made of break-resistant plastic with hanging unit. Suitable for max. 500 m polywire and 200 m tape (10 mm). 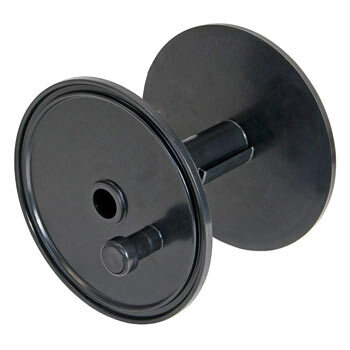 Replacement Drum for Reel "EASY, 44230"
Replacement drum for "EASY" 44230 reel. 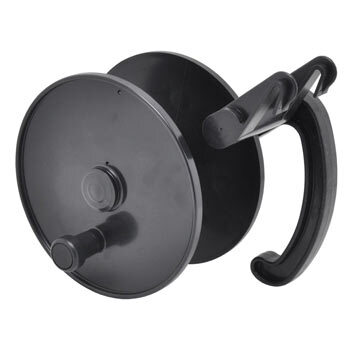 Large reel, made of break-resistant plastic with hanging unit. Suitable for max. 800 m polywire and 400 m tape (10 mm). 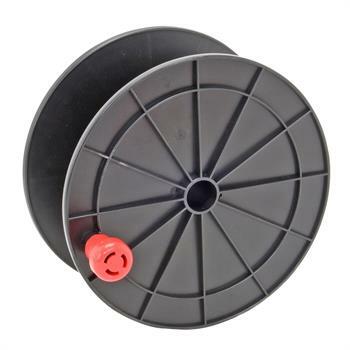 Replacement Drum for Reel "EASY BIG, 44231"
Replacement drum for Euro reel 44360. 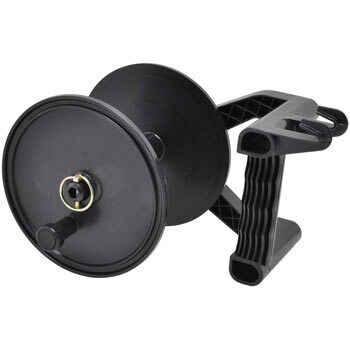 Very strong reel made from break-resistant plastic. 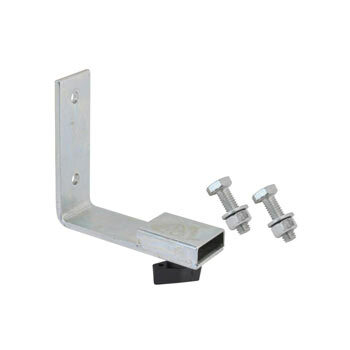 Robust frame with latch, supplied with carrying strap. 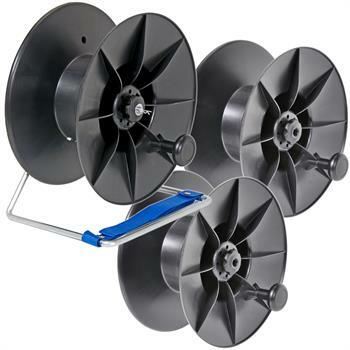 Practical additional drum for the "Farming 2000" electric fence reel. The reel is collapsible, includes turning knob. 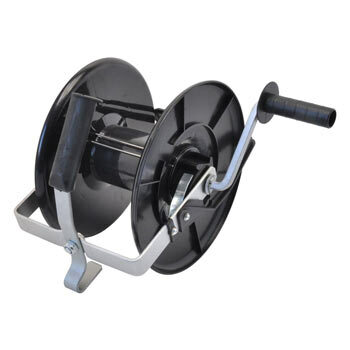 Electric Fence Reel on Frame "Max TURN 2000"
Complete with strong steel frame, drum brake and three-part drum. Suitable for approx. 2,000 m polywire, 400 m rope and 1,200 m electric fence tape. Spare drum for Reel "Max TURN 2000"
The robust drum can be separated into two pieces. Suitable for approx. 2,000 m polywire, 400 m electric fence rope and 1,200 m tape (10 mm). our reel saver set at a fantastic price! You can enjoy many advantages when you opt for an electric fence. Don’t forget that electric fences demand a certain amount of effort and that it is important to pay attention to every detail. Fortunately, useful accessories and tools exist to make the whole thing easier. 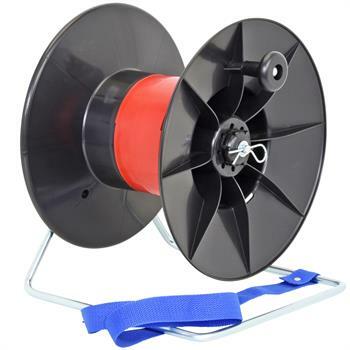 You can rely on electric fence reels to help you erect the fence quickly and easily. 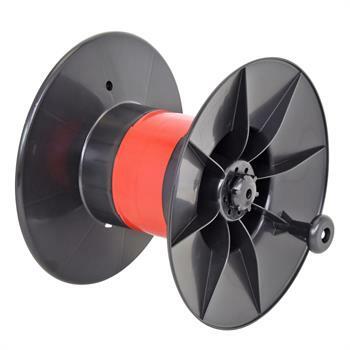 In addition to fence reels, practical manual reels can also be purchased for your electric fence. The conducting material is essential when it comes to safety, and of course, the energiser also plays an important role. Choosing the wide variety of other components depends on the conducting material (in the form of polywire, wire, rope and tape). For instance there are insulators and connectors, connector cables and electric fence reels. 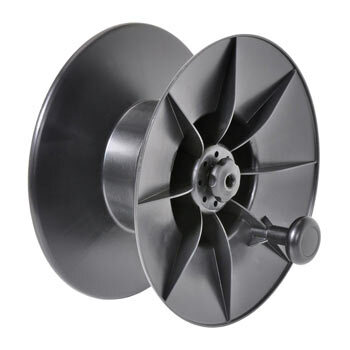 Reels are used for winding and unwinding the conductors and cables and offer additional support. 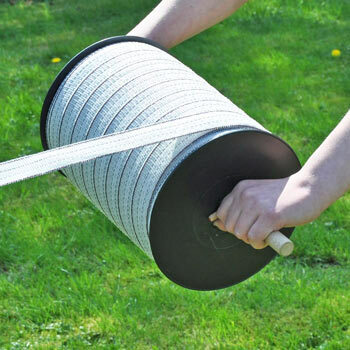 Without manual reels for electric fences, you would have to awkwardly wrestle about trying to unwind, attach and tightly stretch the conductors which are often several hundred metres long. However, with a manual reel, it generally takes just a few minutes and moves of the hand to mount the conductors on the fence. This is not only an advantage when erecting the fence, but also when repairing and extending it. While a permanent fence only has to be set up once – unless you want to relocate the field to another site – a mobile electric fence is constantly re-erected and disassembled. Without an electric fence manual reel, this would barely be conceivable or would take far too much time and effort. Electric fence feels for manual use are suitable both for polywire and for tape. You should of course also take into account the fact that electric fence polywire is thin and round, whereas electric fence tape is flat and broad. So you can wind virtually twice as many metres of polywire than tape onto a reel. 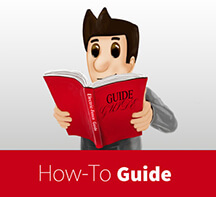 Different size models exist for longer and shorter electric fences and different conductors. 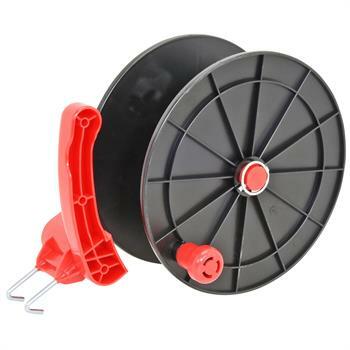 Electric fence manual reels are wonderfully practical and handy. They are made of resistant plastic and are tough and hard-wearing. 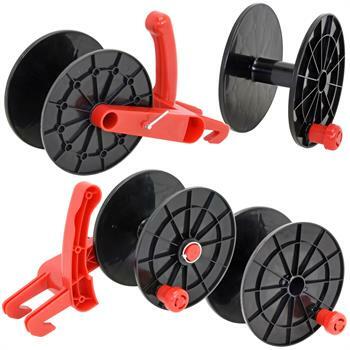 Professional electric fence reels score highly and come with a drum which can be secured to prevent overtravel, a mounting device and additional hooks to ensure a non-slip hold and precise work. 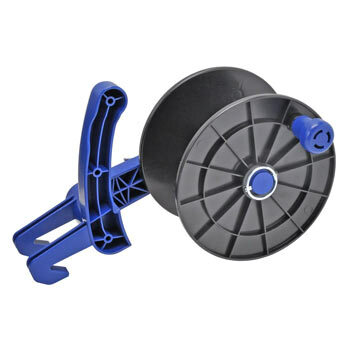 The weather-resistant, stable frame of the electric fence manual reel also speaks in favour of the quality products. If required, the whole thing can be supplemented by an additional drum for electric fence reels. If necessary, it may be appropriate to use large multi-purpose reels. 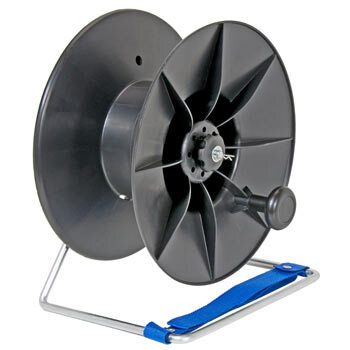 The Euro reel, made in Germany, has been particularly tried and tested if you require a high-performance yet uncomplicated manual reel for your electric fence. 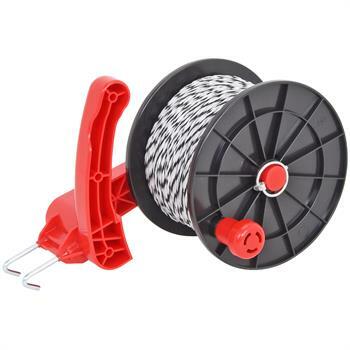 Manual reels with a frame, locking mechanism and carrying strap are also a good choice and are suitable for both electric fence tape and for electric fence polywire. 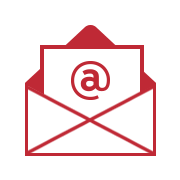 A matching additional reel for winding and unwinding rope can be ordered online at a later stage.